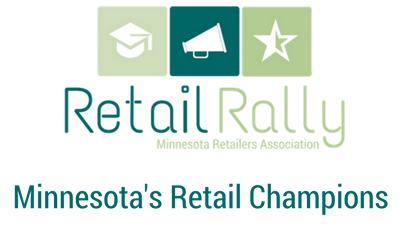 The Minnesota Retailers Association (MnRA) is pleased to recognize ten organizations leading the way in attracting consumers with the announcement of the 2018 Minnesota’s Retail Champions. Winners will accept their awards in person during the Retail Rally event on Tuesday, October 9, 2018, at the Doubletree Hotel in St. Louis Park (1500 Park Place Boulevard, St. Louis Park, MN 55416) beginning at 2:30 p.m. The event features a keynote speech by Amanda Brinkman, “Retail Lessons Learned While Revitalizing Main Streets Across America”. Brinkman is chief creator and host of the “Small Business Revolution - Main Street”—a critically acclaimed HULU series celebrating small businesses and revitalizing main streets across America, and chief brand and communications officer of Deluxe. MnRA started the award process by putting out a statewide call for nominations in the 10 categories. A panel of peer judges reviewed nearly seven dozen nominations and selected the top nominee in each category. Tickets to the event are $39 online at www.retailrally.com. To learn more about Deluxe's Small Business Revolution TV Show visit https://www.deluxe.com/sbrc/small-business-revolution.